Get to know more about us and the story of ClimbingFlex. Hi, we are Stefanie and Carlos. We love climbing in nature! We also enjoy bouldering in the gym, as we think it's more social. We are not flexible yogis who get their foot to the head, and as climbers we know the challenges on the yoga mat very well! We strongly believe that yoga can help every climber to create balance, strength and flexibility. Stefanie is a yoga teacher and appears on the yoga mat in the videos. 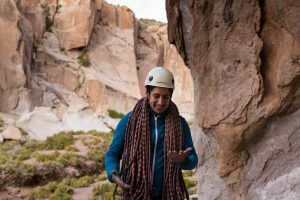 She spent two years in Chile and Spain and started climbing when Carlos invited her to the crag on a winter's day. (yep, it was cold! 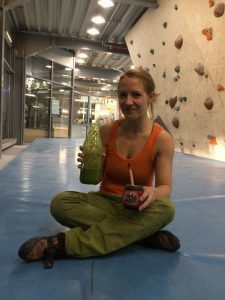 :-)) When bouldering, she loves to take a green smoothie and mate with her. Carlos is a WordPress expert, cheerful and loves cheesecake. He moved from sunny Chile to Frankenjura because of the rocks, the pretzels and the Franconian beer. Carlos sometimes has his creative hours at 3 pm, and he's responsible for the technical and administrative parts at ClimbingFlex. We founded ClimbingFlex in 2012 because we felt that our needs as a climber were not addressed enough in many yoga styles and yoga videos. "Why isn't there more content for less flexible climbers like us? 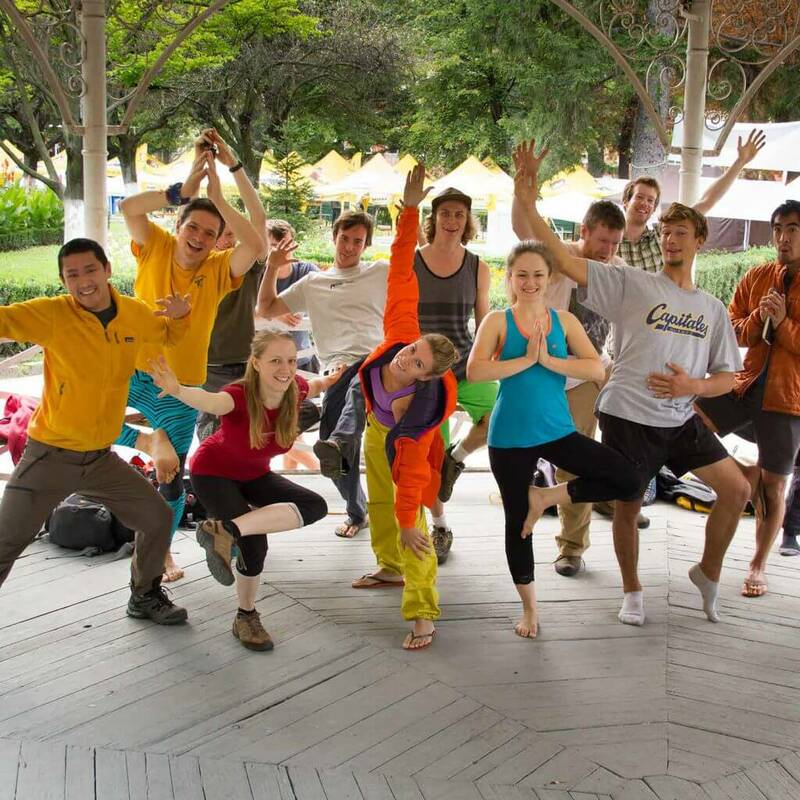 Which yoga poses help me waste less strength when climbing and prevent injuries?" we often asked ourselves. After Stefanie's yoga teacher training, we experimented a lot with yoga after climbing and at home to recover faster and improve our flexibility. The results were astonishing. "If it works for us and feels so good, it should be helpful for other climbers, too", we thought. The fewest things worked right from the beginning. With a lot of persistence and the motivation that we want to make yoga more feasible for climbers, we have repeatedly pulled ourselves together, kept learning, and continued the journey. Every conversation with our climbers on Fit4Climbing or at one of our events is an unbelievably great enrichment for us and reminds us again why we do it all. Meanwhile, we have organized events in Germany, Spain and England and were invited to the Petzl Roc Trip 2014. We love to experience how climbing connects different personalities and different cultures. Our final picture after the Petzl Roc Trip 2014 in Romania. Our yoga with the motto "Adapt the pose to your needs, not the other way around" was well received. "How can we make a small contribution to the environment with ClimbingFlex?" We asked ourselves after we published our two books and developed Fit4Climbing. 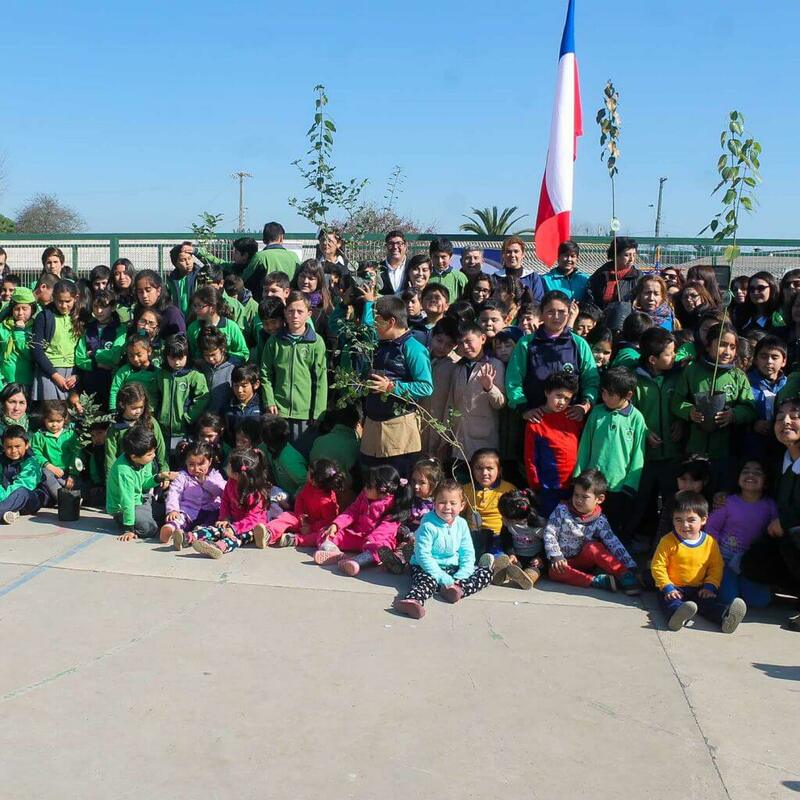 Carlos, who worked as an environmental engineer in Chile, had the idea of ​​planting native trees with schoolchildren at their schools. Every climber who joins the membership program at our virtual yoga studio Fit4Climbing receives a dedicated tree certificate. The tree symbolizes what the climber wants to cultivate the most on the yoga mat.